Home » Armour in England. 10th to18th century. This familiar word is generally associated with the idea of metal; but there were many varieties of defensive military equipment with which metal had little or nothing to do, the principal, and perhaps the earliest, being formed of leather, and surviving the abandonment of plate armour shortly after the commencement of the eighteenth century. 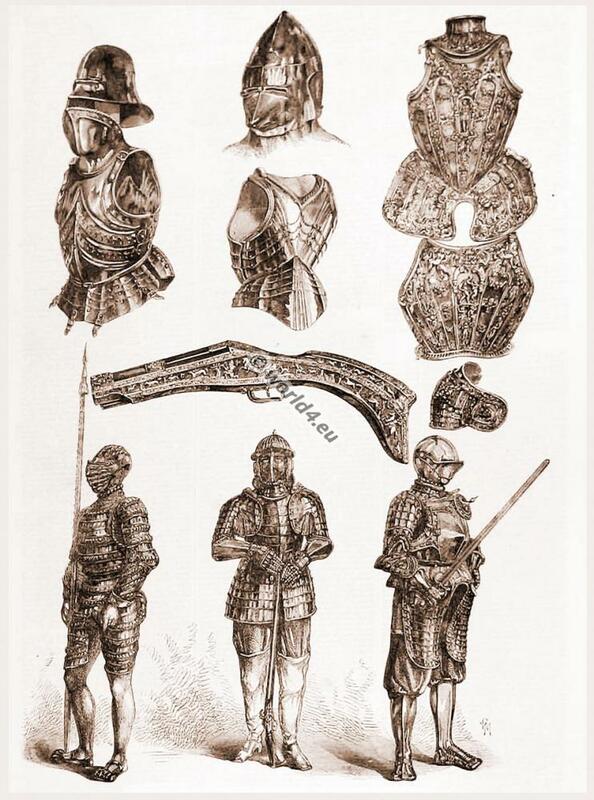 These varieties, as well as the particular portions of the metal armour of the Middle Ages, will be found separately noticed under their several heads in the ‘Dictionary,’ and comprehensively in the ‘General History’ preceding it. I shall, therefore, in this place speak only of armour as popularly understood, and the principal features which distinguished it from the eleventh to the eighteenth century. 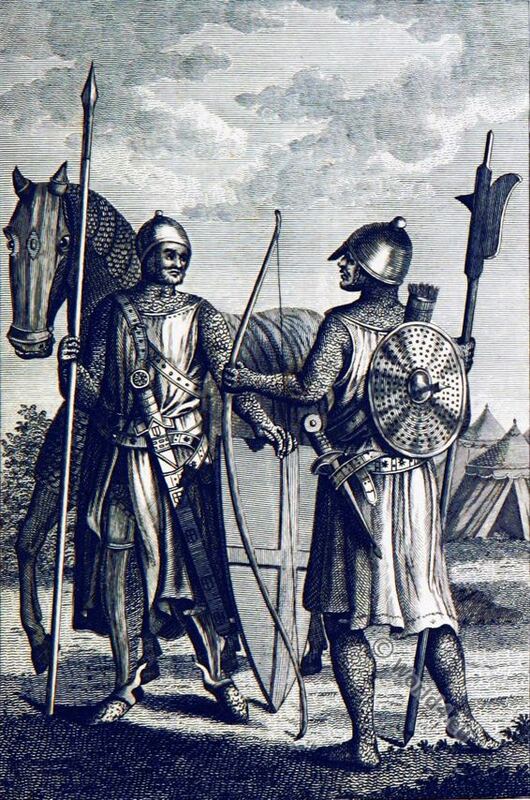 The metal armour of the Normans and Anglo-Saxons consisted of a tunic of what is commonly called “mail,” composed in the earlier instances of iron rings firmly sewn flat upon a strong foundation of cloth or leather, and subsequently interlinked one with the other, so as to form a garment of themselves, known by the name of “chain mail.” Coexistent with these were several sorts of mail to which Sir S. R. Meyrick gave the names of “tegulated,” “trellised,” „mascled,“ “banded,” &c., scale mail being already recognized by antiquaries in the “lorica squamata“ of the Romans. 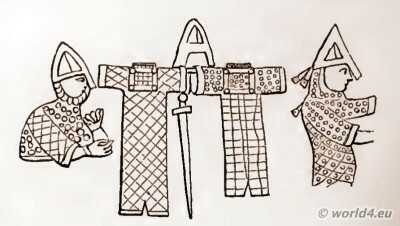 Cavillers have objected to these designations, and maintained that the differences visible in representations of the armour of that day were only attributable to the manner in which the several artists indicated ring or chain armour. Subsequent study and experience have established the truth of Meyrick’s observations, and no better nomenclature has yet been proposed for their definition. Their peculiarities will be minutely illustrated under the head of MAIL. 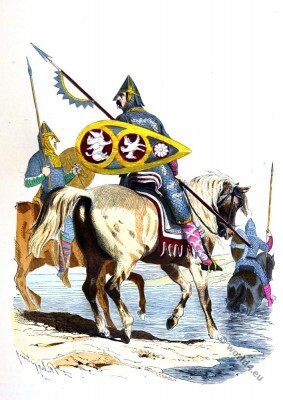 The Anglo-Saxon from the Cottonian, B.IV. The Anglo-Saxon MSS. furnish us with numerous examples of the ring mail. Here is one from the Cottonian MS., marked B. IV., Brit. Mus., of the close of the tenth or beginning of the eleventh century. The subject is Abraham rescuing his nephew Lot; and the Anglo-Saxon illuminator, as customary, has represented the Hebrew patriarch in the military habit of his own period. 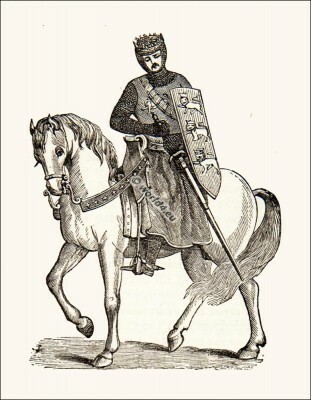 William, Duke of Normandy. From the Bayeux Tapestry. The Bayeux Tapestry presents us with specimens of nearly every other variety. Our cut, taken from that valuable relic, shows the ringed, the mascled, the tegulated, and the trellised varieties. The legs were undefended, save by bandages of cloth or leather crossing each other over the chausses or hose, and reminding us of the pattern of the Scotch stockings of the present day, which we might fancy perpetuated the fashion. The helmet was sharply conical, with a nose-guard, to which the collar of the mail hood was occasionally hooked up the better to protect the face. 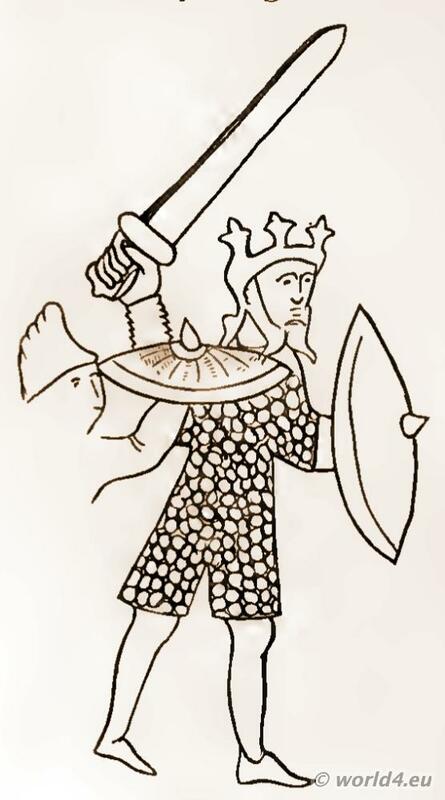 The shield of the Saxons was ordinarily round, with a boss or spike in the centre, but in the Bayeux Tapestry some of the chiefs are represented with long kite-shaped shields like those of the Normans, which the latter appear to have imported from Italy. The weapons in use were the sword, the lance, the javelin or dart, the bow, the war-club, and a long-handled axe peculiar to the Saxons, which is in their language called a byl (bill), and by Norman writers a guisarme, though bearing no resemblance whatever to the weapons known by those names. The Battle of Hastings took place on 14th October 1066 and was the first military success of the French Normans in the conquest of England. 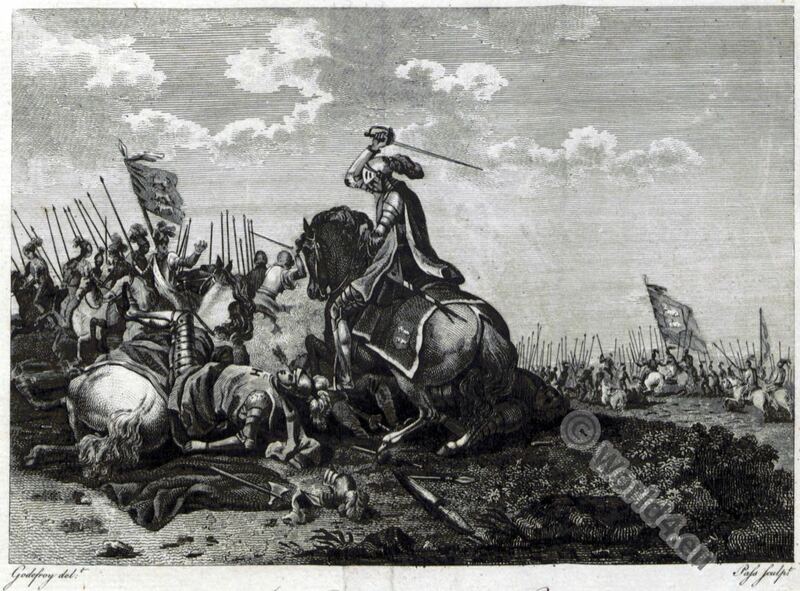 The Norman army under Duke William the Conqueror defeated the Saxons under their king Harald II. 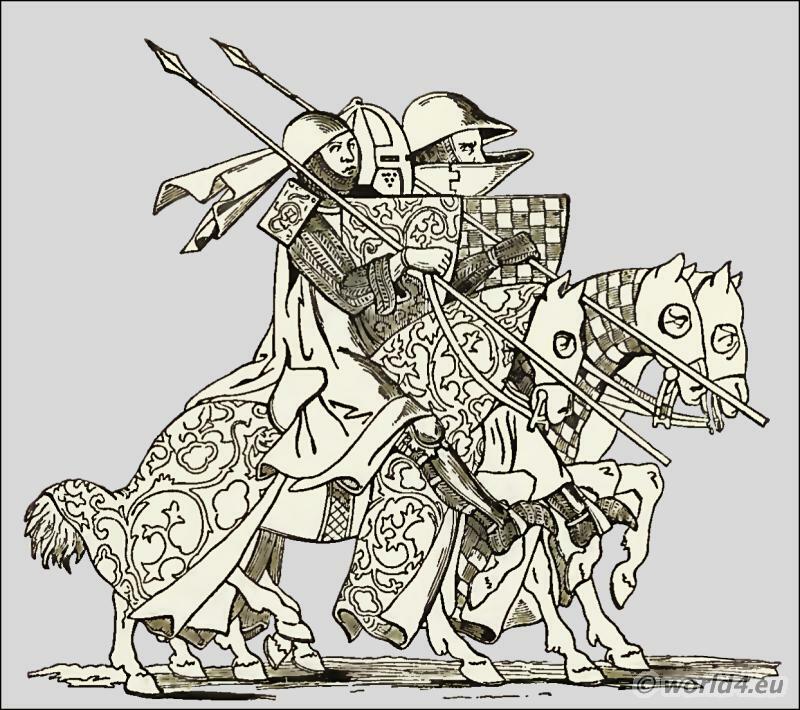 Norman soldiers, as brought into England by William the Conqueror anno 1066. 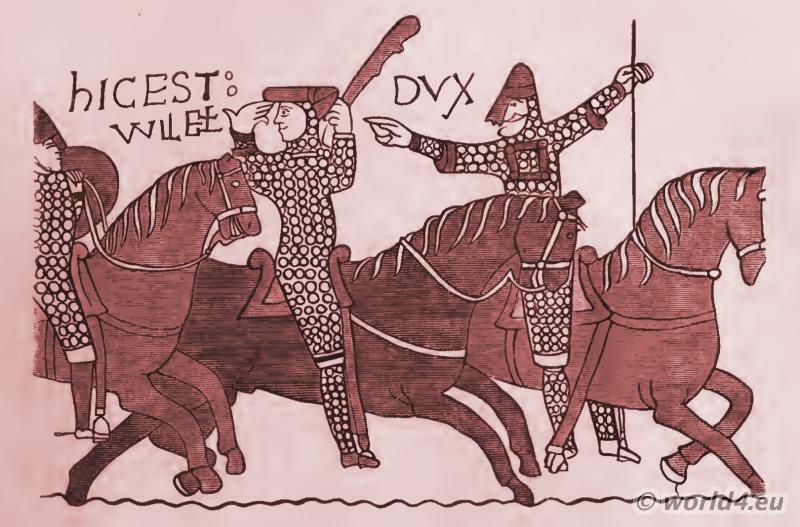 Norman knights in 1066. Battle of Hastings. William the Conqueror. At a later period additions were gradually made to the mail armour of the twelfth century till the whole body, from head to heel, and the very tips of the fingers, were encased with iron in some form or other. We have here a knight in complete mail of the kind denominated „mascled,“ from a psalter in the Doucean Collection now in the Bodleian Museum at Oxford; the mail protecting the legs, occasionally differing from that of the hauberk, the improvement of interlinked rings ultimately superseding all other varieties, and presenting to us the knight in a complete suit of chain, over which descended, in graceful folds, the silken cyclas or surcoat, at first plain or embroidered with gold or silver, and subsequently with his armorial bearings, and confined round the waist by a richly ornamented belt, from which depended his trusty sword. 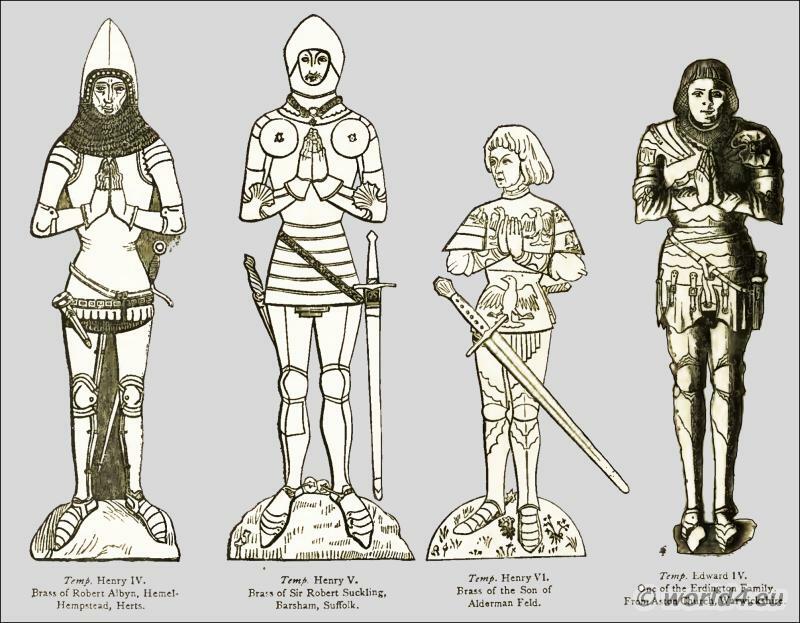 The effigies in the Temple Church, London, and the numerous sepulchral monuments, happily preserved to us in our cathedrals and parish churches, illustrate the military costume of the thirteenth century with great fidelity of detail and ornament. We give two of the earliest examples; the first from an effigy in Walk ern Church, Hertfordshire, and the other, a little later, from the Temple. 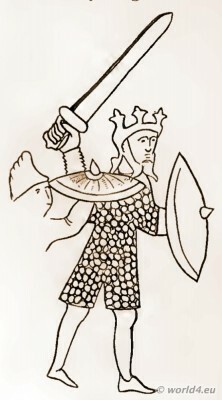 The beautiful effigy of Brian Lord Fitzalan, in Bedale Church, Yorkshire (A.D. 1302), affords us a fine specimen of the sword belt above mentioned, and of the next advance in armour, which was the addition of knee-caps, either of steel or of a preparation of leather called “cuir bouillie.“ The armpits were also protected by palettes or gussets of similar materials, the neck by plates of various forms affixed to the shoulders, and called, from their position, “ailettes” (little wings), and the fronts of the legs by shin-guards (bainbergs), also of steel or leather, sometimes highly ornamented. Steel skull-caps of divers shapes and names were worn over the mail hood, and the home or helm, with or without a crest, makes its appearance. The reproduction of elbow-pieces and brassarts rapidly followed; and from the middle of the reign of Henry III. to nearly the close of that of Edward III. 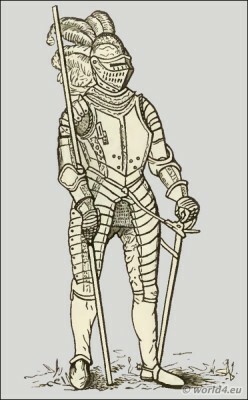 the period is known to antiquaries that of “mixed armour.” (See next plate: Ailettes, and the accompanying group of knights on horseback and the figures of the De Clares, Despensers, and others in the windows of the Abbey Church of Tewkesbury, painted in the reign of Edward 11.). With the reign of Richard II. commences the third great change in the military equipment, the period of complete plate, which, varying only in the shape of particular portions, lasted till its gradual abandonment, piece by piece, during the seventeenth century. 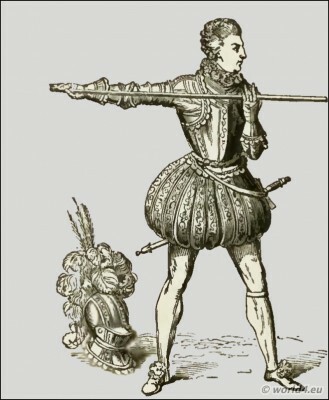 The invention of firearms in the reign of Edward lV., and the improvement of field artillery (the exact date of the introduction of which is still a contested point), led, no doubt, to the disuse of a cumbrous, complicated, and costly equipment, which no longer ensured them an adequate advantage in its defensive quality. The buff coat offered nearly as fair a resistance to the thrust of the pike or the cut of the sabre. The cuirass, though pistol-proof, was sent “into store.” A gorget was worn for a few years by officers, and with that departed the last remnant of the body armour of our ancestors. Charles I of England. King and Martyr. Military in the time of Henry VIII. From the Cotton MSS. Breastplates of the time of Henry VIII. 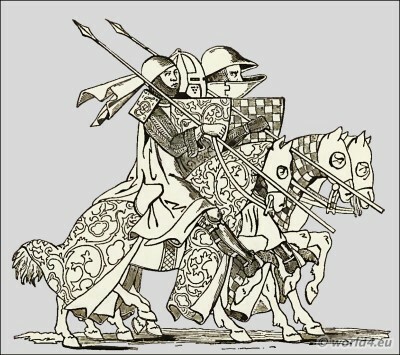 Group of Knights on Horseback. 1300-1327. In illustration of the first half of this third period, comprising about a hundred and fifty years, the reader is referred to the engraving from a miniature in the curious MS. containing a metrical history of Richard II., in the Harleian Collection, British Museum, No. 1379, representing that unfortunate sovereign conferring the honour of knighthood on Henry of Monmouth, afterwards Henry V., the son of the man who was so soon to defeat him. The basinet with the beaked vizor, which is the marked characteristic of the reign of Richard II. and Henry IV., the ample gorget of chain, and the surcoat, are faithfully depicted. The brasses and sculptured effigies of knights of the reign of Henry V., are noticeable for the absence of any appearance of chain. The camail is superseded by a gorget of plate overlapping the upper edge of the breast-plate, to the lower part of which is appended a skirt, composed of what are called “tassets,” lateral bands or ‘plates of steel, protecting the wearer from the waist to the mid-thigh, over which the military belt is, in some examples, seen fastened as previously over the jupon. In the reign of Henry VI. the number of these bands is diminished, and to the lowest we find two broad plates called “tuilles,” attached by straps and buckles, defending the front of the thighs. The toes of the sollerets, or steel shoes, are extravagantly long and pointed, and the shanks of the spurs are equally elongated. 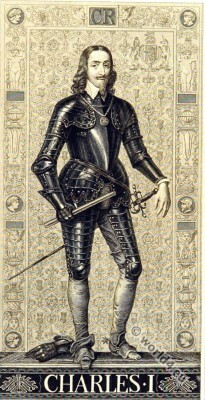 The vizored basinet gives place to a head-piece called a “salade,” the lower part of the face being protected by a chin-piece called a “hausse col.” The jupon and military belt have also disappeared, and a loose tabard with short open sleeves, embroidered with the armorial bearings of the wearer, takes the place of the former. The breast-plate is composed of two pieces, the lower one lapping over the other, to which it is secured by a strap and buckle, and the back-plate is articulated and moulded to the form of the body with anatomical precision and exquisite taste. 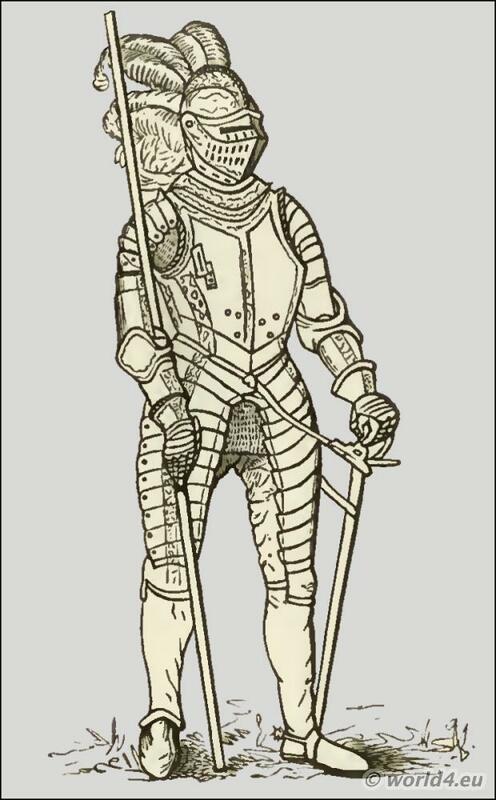 The coudes, or coudieres (elbow-pieces), are extremely large, some being fan-shaped, of elegant design; and the art of the armourer may fairly be said to have culminated at the close of the fifteenth century. A marked change took place during the reign of Henry VII. The armet, or close helmet, displaced the salade. Pass-guards, plates of steel rising perpendicularly upon the shoulders to ward off the thrust or blow of a weapon from the side of the neck, were introduced, a similar service having been formerly rendered by the long discarded ailettes. The breast-plate was again formed of one piece; but the lower portion was globose, and frequently fluted, as well as the whole suit; some portions being elaborately engraved. This recently invented art became thenceforth greatly resorted to for the ornamentation of every portion of armour, and to it was shortly added that of embossing, and what is known by the name of repoussé work. Periods, Henry IV., Henry V., Henry VI., Edward IV. Magnificent examples of such suits are to be seen in the Louvre and Musee d’Artilierie at Paris, the Ambrass Collection at Vienna, and the armouries of Dresden, Berlin, Florence, Madrid, and the principal cities of Europe, as well as in the cabinets of private collectors, Our own noble, but sadly neglected, armoury at the Tower is also rich in suits of this description, one of the most interesting being a present from the Emperor Maximilian to King Henry VIII., on his marriage with Catherine of Aragon. Suit of Henry VIII. Presented by the Emperor Maximilian. Tower of London. It is furnished with ample steel skirts, called “lamboys,” in conformity with the fashion of the civil costumes of the period, elaborately engraved with the martyrdom of St. Catherine and other similar subjects. 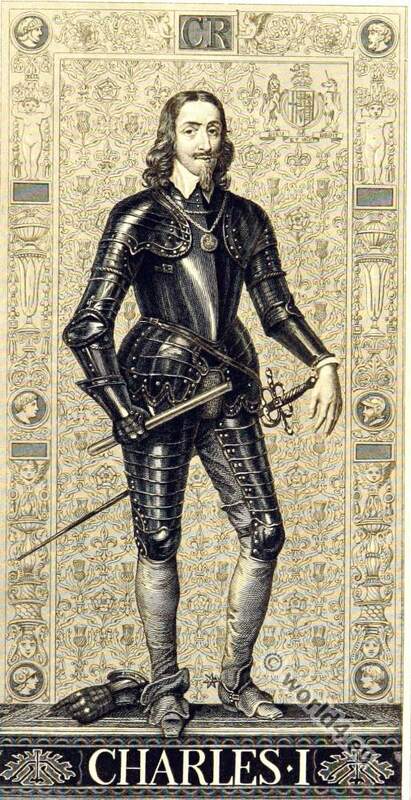 Armour was also made in imitation of the puffed and slashed dresses that were in vogue about the same time. The sollerets were round-toed, and in the reign of Henry VIII. became as extravagantly broad and square as they had previously been long and pointed. Richly embossed casques of a classical form, with cheek-pieces, marked the revival of the arts, and a close helmet, called a “burgonet,” was added to the head-pieces already adopted. 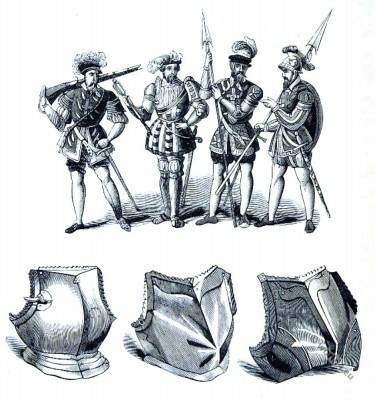 The breast-plate assumed various shapes during the reign of Henry VIII., which will be described under the separate head of BREAST-PLATE, and the introduction of trunk hose led to that of long tassets reaching from the waist to the knees, and rounded at the extremities. 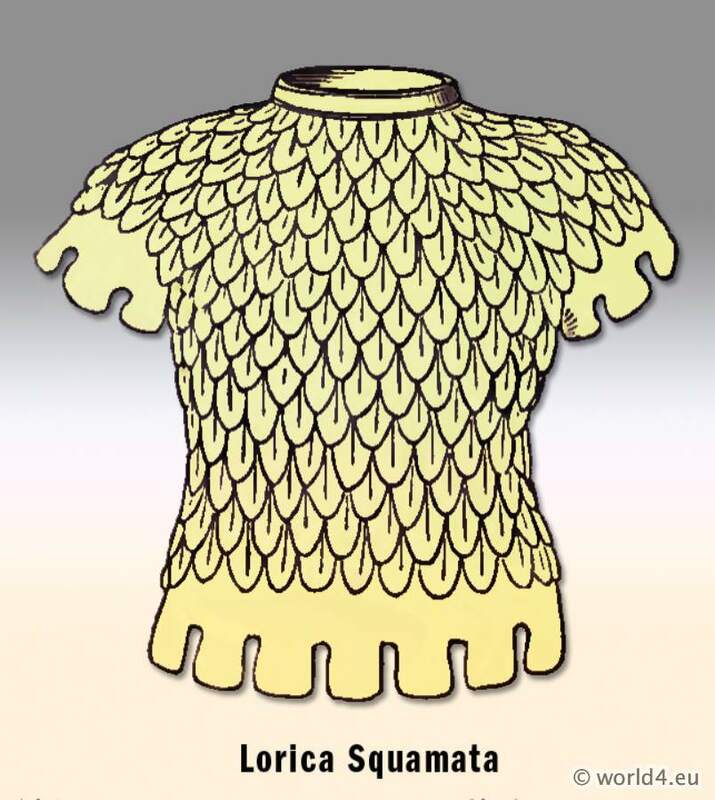 During the remainder of the sixteenth century the principal characteristic is the form of the breast-plate, which gradually assumed that of the “peasecod bellied doublet,” so remarkable in the male costume of the reign of Elizabeth, and still worn during that of James I. 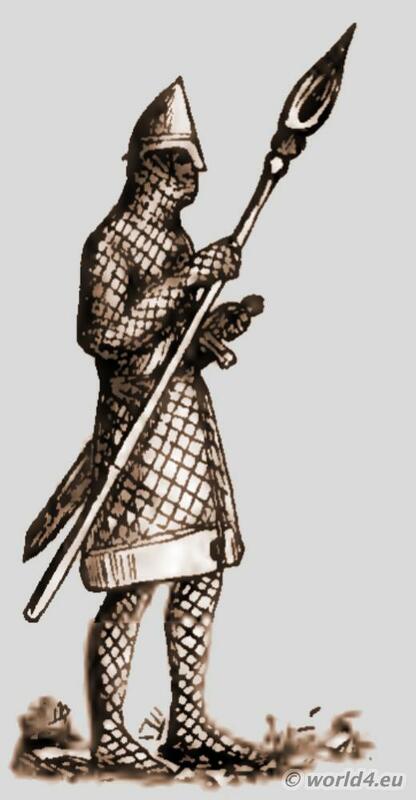 A head-piece called the “morion” was introduced from Spain, and was generally worn by the infantry. 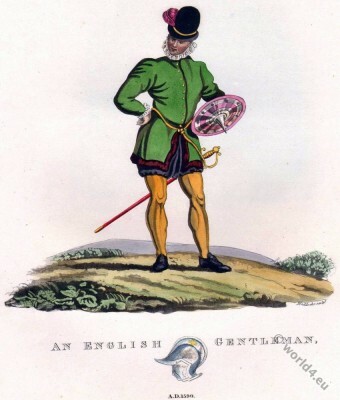 Armour for the legs and feet was discarded, and in its place we find leathern boots reaching above the knees, where they were met by the lengthened tassets, now terminating in steel caps firmly secured by straps and buckles. Cavaliers opposed to them frequently wearing only a gorget over the buff coat and a casque or triple-barred helmet. I. Mail armour. 2. Mixed mail and plate. 3. Complete plate. The first extending to the reign of Edward I.; the second to that of Richard II. ; and the third to its ultimate abolition. I have spoken only of armour for the field. Source: DICTIONARY of DRESS. GENERAL HISTORY OF COSTUME IN EUROPE. BY JAMES ROBINSON PLANCHÉ, ESQ., LONDON: CHATTO AND WINDUS, PICCADILLY. 1879. 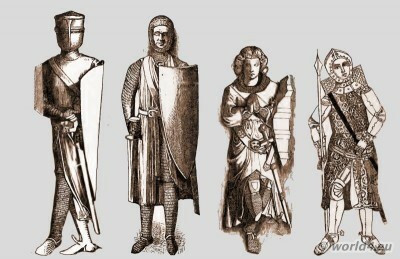 Medieval Flanders costumes. 15th century. 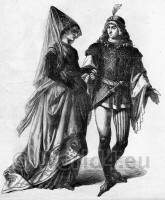 Italian gothic costumes 15th century. Jack Cade and his insurrection. English history 1450. Création d'un chevalier au 15ème siècle. Wandering musicians of the 15t century. The ladies travel to see. 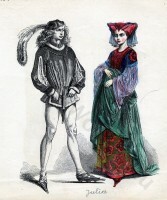 Burgundy fashion 15th century. Clans in the Roman Empire. The shields of the Gauls. Armor in England from the 10th to the 18th century. Offensive and defensive armor and weapons. Collection. The Varangian Guard. Viking Chiefs 5th Century. 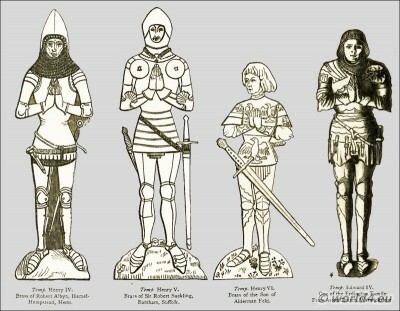 Life-size warrior figures in full armor and equipment. Germany military in 1530. Renaissance Mercenaries. German lansquenets during the thirty Yearsâ€™ War. Knights tournament duel jousting, Renaissance 16th century. Offensive and defensive armor and weapons. Firearms and offensive weapons. Renaissance 16th century. German blackened steel armor. Renaissance weapons. 30 years war weapons. Helmet, gloves and a musketeer rifle. Iron Gloves, gauntlets of the 15th century. The Schaller. 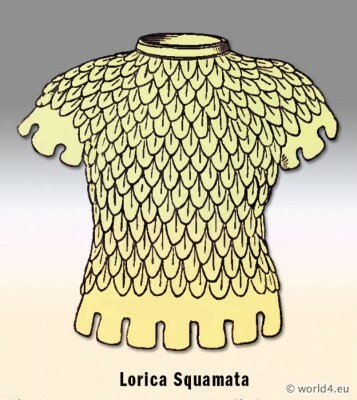 Helmet and neck cover from the 15th century. 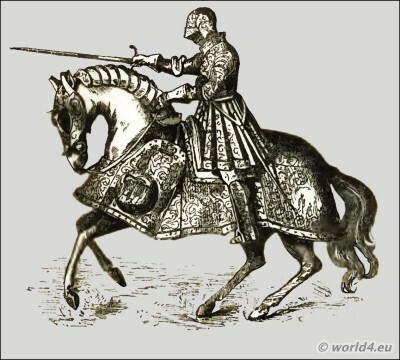 Mounted Knights. 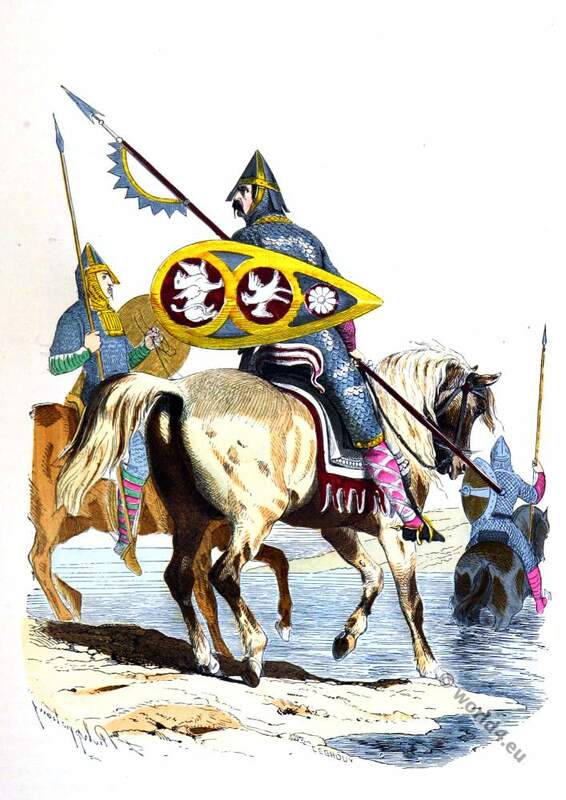 Heavy cavalry 16th century. Reign of Louis XVI. 1780 to 1789. Le Pouf. 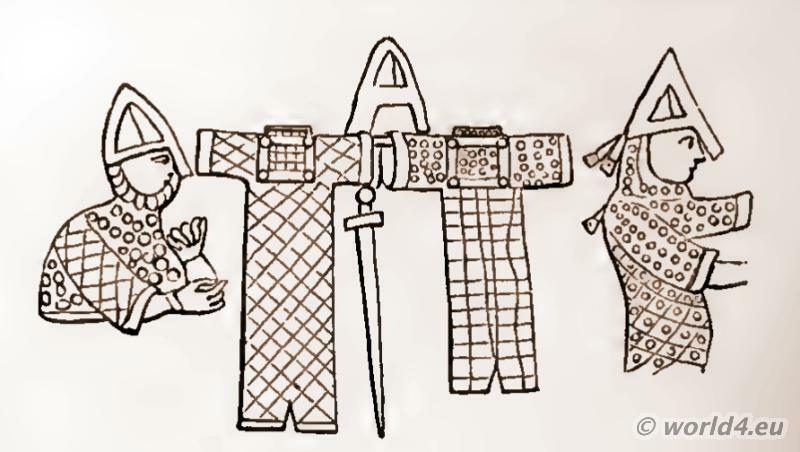 Fashion in the Ancien RÃ©gime. The Reticulated Headdress. 15th century. Medieval Burgundy era. The Hennin. 15th century. Medieval Burgundy era. 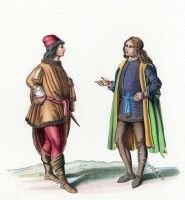 Costumes de Noblesse du 14ème siècle. Histoire de la mode médiévale. Noble anglaise. 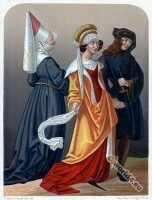 Mode féminine du Moyen Age. 13ème siècle. 13ème siècle. Gabrielle d’Estrées, mistress of the French King Henry IV. 16th century, Renaissance fashion era. Madame de Pompadour. Her political power and general influence to Louis XV. Rococo era. The Corset and the Crinoline. Introduction of Cottes-Hardies. The Ladies of Old France. 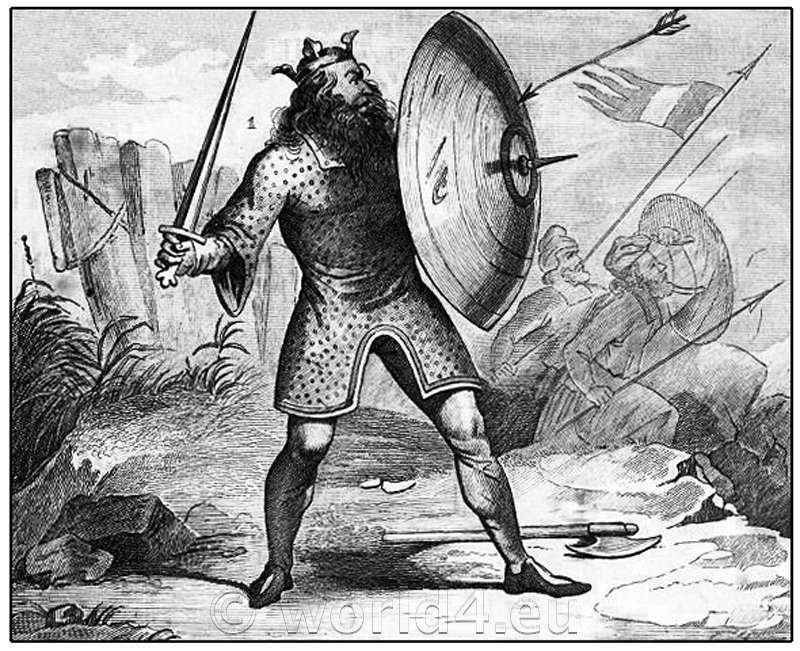 Pictures and Royal Portraits Illustrative of English and Scottish History. Characters of The Commedia dell Arte. Italian Renaissance Theater. On the history of costumes. Fashion gallery from ancient until the 19th century.